The Flint Rehab products and programs are designed to improve function and mobility after a stroke. 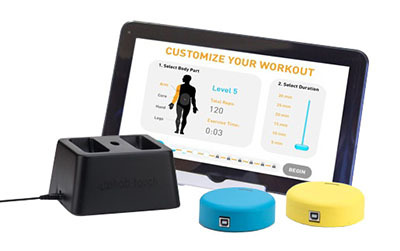 Use these products to regain strength and dexterity in a fun and engaging way. 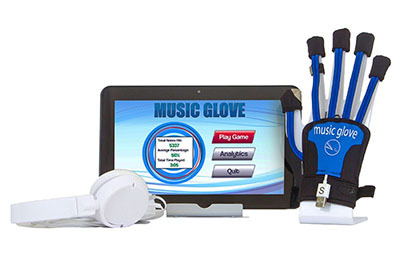 The MusicGlove is a post-stroke recovery hand glove that is designed to improve hand function through therapeutic music and gaming. It works by motivating users to perform hundreds of therapeutic hand and finger exercises while playing an engaging musical game. 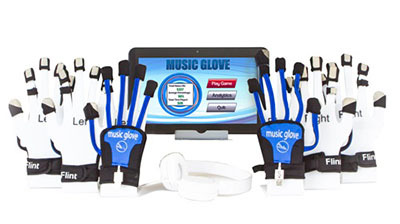 Additionally, the MusicGlove Clinical Suites are structured to strengthen patients' hand and finger dexterity and movements that have been damaged after neurological injuries. Included are six gloves for both the right and left hand (Small, Medium, Large) and a 10” tablet with all the software users need already installed. The gloves are made with sensors which boosts the number of repetitions that the wearer will perform. The tablet features a simple touchscreen interface and is portable enough to allow users to use it just about anywhere. Also included with this suite are Premium Headphones, connector cable and User’s Manual. 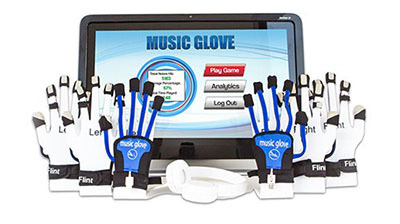 The MusicGlove is a post-stroke recovery hand glove that is designed to improve hand function through therapeutic music and gaming. 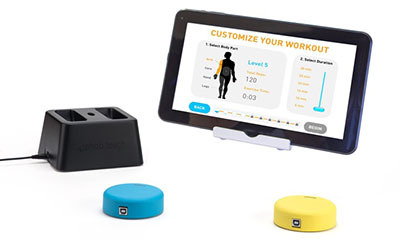 It works by motivating users to perform hundreds of therapeutic hand and finger exercises while playing an engaging musical game. Additionally, the MusicGlove Clinical Suites are structured to strengthen patients' hand and finger dexterity and movements that have been damaged after neurological injuries. Included are six gloves for both the right and left hand (Small, Medium, Large) and a 21” touch screen computer with all the software users need already installed. The gloves are made with sensors which boosts the number of repetitions that the wearer will perform. The 21” computer features a simple touchscreen interface and has a large enough screen to accommodate all types of users. Also included with this suite are Premium Headphones, connector cable and User’s Manual. Dimensions: 15" x 5" x 11"
Dimensions: 16" x 5" x 1"
The Song Expansion Pack adds more songs for the MusicGlove. Use these extra songs to motivate patients improve hand function. 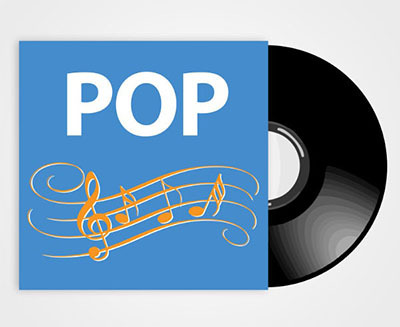 Includes 12 new Pop songs – 4 for each level of difficulty. This Expanision pack comes on a micro-SD card and has instructions. 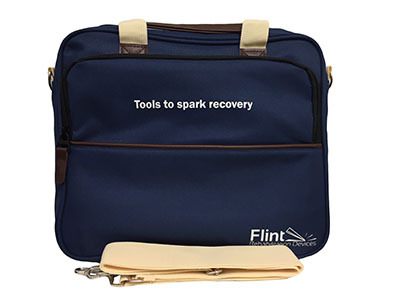 Dimensions: 4" x 5" x 1"
The Flint Travel Bag is perfect for those who want to do rehab on the go. Use this lightweight travel bag to hold either the MusicGlove or FitMi Clinic Portable Suite. Dimensions: 1.5" x 11.5" x 13.5"
Cycli is a Bluetooth-enabled portable cycle that helps improve balance and leg mobility after a stroke. 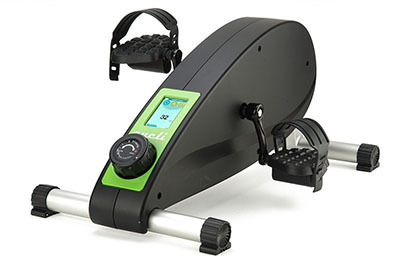 Use this portable cycle to exercise and enjoy other activities from the comfort of your own home. Includes Front and Rear Legs, Cycle Case, 2 Pedals, Power Cord, Screws, Chair Strap, Tools for assembly and User’s Manual. Dimensions: 27" x 10" x 11"